Out now on DVD and Blu-ray we have Fury. A film the quote on the case says is “the best war film since Saving Private Ryan and Platoon”. That’s lofty praise. Does Fury live up to it? Fury follows an American tank crew in WWII, a part of the war other films have barely touched upon. The crew is made up a cast of colourful characters headed by Wardaddy, played by Brad Pitt. When one member of the crew dies they need a new recruit, that’s where Logan Lerman’s Norman comes in. He is us, the audience. He’s seeing all of the horrors for the first time as we are. And there are plenty of horrors throughout Fury’s 2-hour runtime. Set during the final weeks and months of WWII, Fury see’s the tank and her crew rolling through Germany and gunning down Nazi’s. But the real focus of the film is on the crew and the camaraderie between men in times of absolute horror. Like director David Ayer previous film End of Watch¸ Fury deals with a lot of male bonding. And like End of Watch, you don’t expect it to be as effective and often heart wrenching as it is. One reason it is so effective is the fabulous acting of everyone involved. Brad Pitt is excellent as the commanding but often brutal Wardaddy, tempting you to hate him but then pulling it back with a moment of humanity. Logan Lerman is awesome as the new recruit, there against his will but forming a connection with these men. The big surprise for me was Shia LaBeouf. As the religious ‘Bible’ he is in charge of the cannon on the tank. And he is excellent, putting up with all the crap the guys throw at him about his religion and keeping his faith in even the worst situations. The film would be great if it was just two hours of dialogue between these guys. The action in the film is spectacular also. It’s realistic, gory, dirty and just brutal. One great scene see’s Fury and three other tanks go up against a German Tiger tank and almost get wiped out. You almost can’t breathe during it and the eye to detail on everything from the gunfire to the orders yelled inside the tank is just brilliant. As I mentioned earlier, Fury does not shy away from the horrors of war. A few critics picked up on this and criticised the film for being almost pornographic in its level of violence. I think ultimately it comes down to taste. It is often horrible and shocking, but damn it gets a response out of you. The final scene of the movie, and the last 45 minutes, is one huge action sequence which sees the Fury up against about 300 SS Soldiers. It’s the most intense action scene I’ve seen in a long time and it gives the final battle in Saving Private Ryan a run for it’s money. Nazi’s get cut apart, blown to pieces, shot and stabbed. If that doesn’t sound like your cup of tea, then Fury may not be for you. In Fury war is war. The crew is used to it, they’ve seen it all and they’re in it for payback. The film doesn’t want you to spend time reflecting on the horrors of it all, this is just how it is. As Wardaddy tells Norman, ‘History is violent.’ Ultimately the film is about the bromance. About a group of guys who are resigned to fighting and dying surrounded by their best friends. It’s sad but also poignant. As the crew of the Fury says after taking out a regiment of Nazis, “Best job I ever had.” A lot of WWII stories hinge on the relationships formed in foxholes and Fury does it as well as I’ve ever seen. 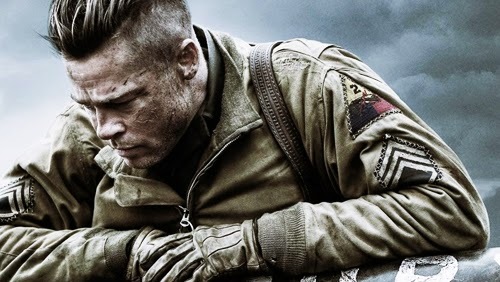 Fury fully earns its full marks, 5/5.